A new film, released this month, reveals the enormous scale of Vital Energi's state-of-the-art energy centre for the £2 billion King's Cross Central development and the logistical challenges faced by its engineers. The film brings the project to life showing the detailed construction of the CHP energy centre which will serve the 67-acre city centre regeneration scheme - one of the UK's most significant and high profile developments. 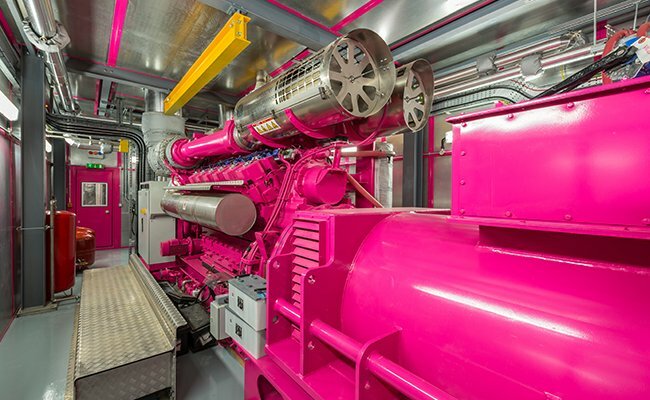 Key milestones in this mammoth project have been captured on camera, including delivery and installation of the two 74,000 litre thermal stores, the 2MW CHP engine, painted pink in honour of charity Breast Cancer UK, and the incredible feat of lowering two enormous 10MW gas-fired boilers into position. When completed in 2014, the main T1 energy centre at King's Cross will house three 2MW CHP engines and three 10MW gas-fired boilers to provide heating, hot water and locally generated electricity to the development. The new eight million square foot King's Cross development consists of 25 new office buildings, 20 new streets and 1,900 new homes. It is Europe's largest city centre regeneration scheme. The Guardian and Observer newspapers have already made it their new London HQ and Google is building a new 1 million square foot HQ which opens in 2016.